Beijing, China - February 18, 2012 - Today, Daimler and its Chinese partner Beiqi Foton Motor Co., Ltd. held a festive ceremony to celebrate the reception of the business license for the joint venture Beijing Foton Daimler Automotive Co., Ltd. BFDA will enable Daimler's commercial vehicle division to participate extensively in the Chinese market for medium- and heavy-duty trucks. The market's volume has doubled over the last five years, and more than one million trucks are now being sold in this segment in China. 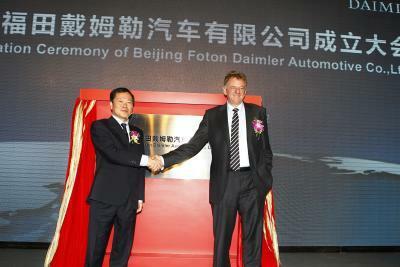 Festive Ceremony in Beijing: Daimler and Chinese Truck Manufacturer Foton Celebrate Launch of Joint Venture Beijing Foton Daimler Automotive Co., Ltd.: Head of Daimler Trucks Andreas Renschler (on the right) and Beiqi Foton. Festive Ceremony in Beijing: Daimler and Chinese Truck Manufacturer Foton Celebrate Launch of Joint Venture Beijing Foton Daimler Automotive Co., Ltd.
On February 18, Daimler and its Chinese partner Beiqi Foton Motor Co., Ltd. held a festive ceremony to celebrate the reception of the business license for the joint venture Beijing Foton Daimler Automotive Co., Ltd. 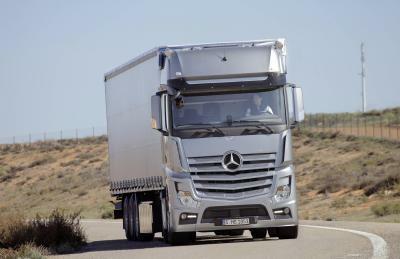 The heavy duty truck Auman “GTL” will be produced in China by the Joint Venture in future and will also be available with a Mercedes-Benz engine. To commemorate this event, the partners unveiled a plaque in Beijing bearing the official name of the joint venture, which will operate from the Foton Auman facility in Beijing’s Huairou district. BFDA will enable Daimler’s commercial vehicle division to participate extensively in the Chinese market for medium- and heavy-duty trucks. The market’s volume has doubled over the last five years, and more than one million trucks are now being sold in this segment in China. Last year, China accounted for around 40 percent of total sales of medium- and heavy-duty trucks worldwide. 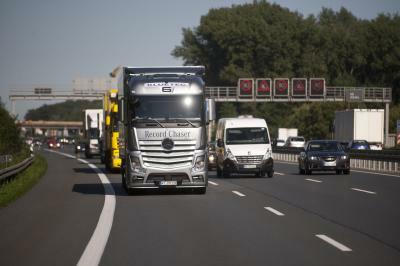 “By founding BFDA, we have taken another step forward in the global growth strategy of Daimler Trucks, as well as the local expansion of our product portfolio in China: Our 50 percent stake in Beijing Foton Daimler Automotive will enable us to play a major role in the Chinese truck market and give us access to the attractive volume segment,” stated Andreas Renschler, Member of the Board of Management of Daimler AG and Head of Daimler Trucks and Daimler Buses. “The establishment of the joint venture between Daimler Trucks and Beiqi Foton lifts the longstanding association between Daimler and BAIC here in China to a new level, and will greatly strengthen our strategic and operational cooperation,” said Xu Heyi, Chairman of Beijing Automotive Group Co., Ltd. (BAIC), Foton’s biggest shareholder. 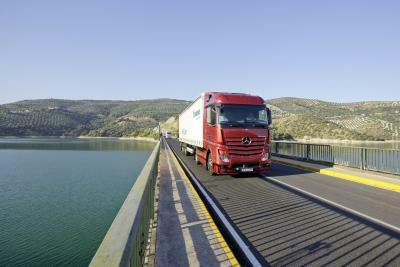 The new Mercedes-Benz Actros - “Truck Of The Year 2012”: The new Actros at the Sommertesting in Granada. The ceremony was followed by the constituent meeting of BFDA’s Board of Directors, chaired by Andreas Renschler and Wang Jinyu, President of Beiqi Foton. The BOD appointed BFDA’s Board of Management, with Wu Yuejun from Foton as President and Stefan Albrecht from Daimler as Executive Vice President. During the first BOD meeting, the two sides finalized the agreed-upon contracts with BFDA and established the organizational structure of the joint venture, the company guidelines, and the next steps for future development. 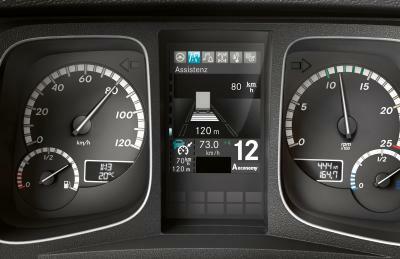 10,000 km long-distance comparative test drive. 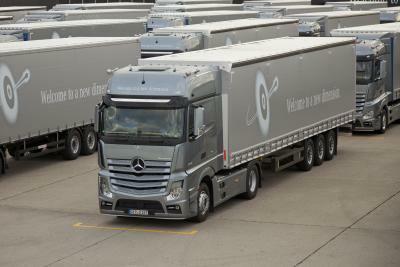 New Actros: more mileage from less diesel. Besides making a financial investment, Daimler will share responsibility for the joint venture’s Finance, IT, Quality Management, and Development departments. In addition, Daimler will set up the production facility for the OM 457 engine at BFDA’s headquarters. The OM 457 engine, which is being successfully used in Mercedes-Benz commercial vehicles in Europe and Latin America, will meet the future China IV emissions standard (corresponds to Euro IV). Foton contributes its existing Auman medium- and heavy-duty truck business, including the production sites and the sales and service network. The joint venture will also be able to draw on Foton’s market know-how in China and the rest of Asia to facilitate faster business development across the entire region. 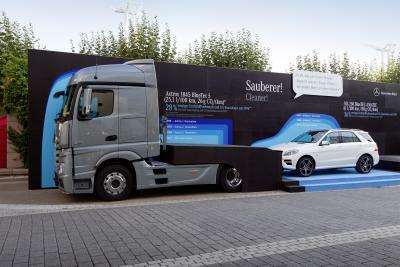 Safe, clean and economical: "The future begins today" – the motto for the Frankfurt International Motor Show also applies to modern-day high-tech trucks. 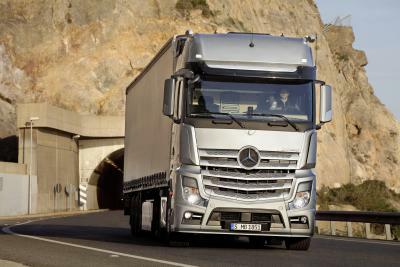 “The great progress made during the past few months has now cleared the way for both partners to jointly start the day-to-day work and forge ahead with this exciting endeavor,” said Ulrich Walker, Chairman and CEO of Daimler Northeast Asia. 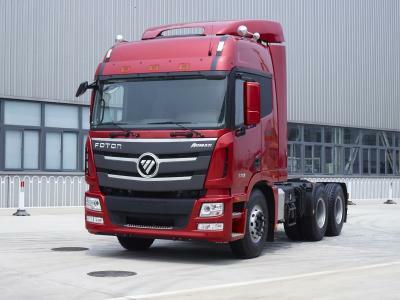 Foton has experienced rapid growth since entering the truck business in 1998. Last year it sold over 100,000 medium- and heavy-duty trucks, making it a key player in China’s truck market. A second truck plant is currently being ramped up in Beijing’s Huairou district to give the BFDA joint venture a total production capacity of 160,000 trucks.